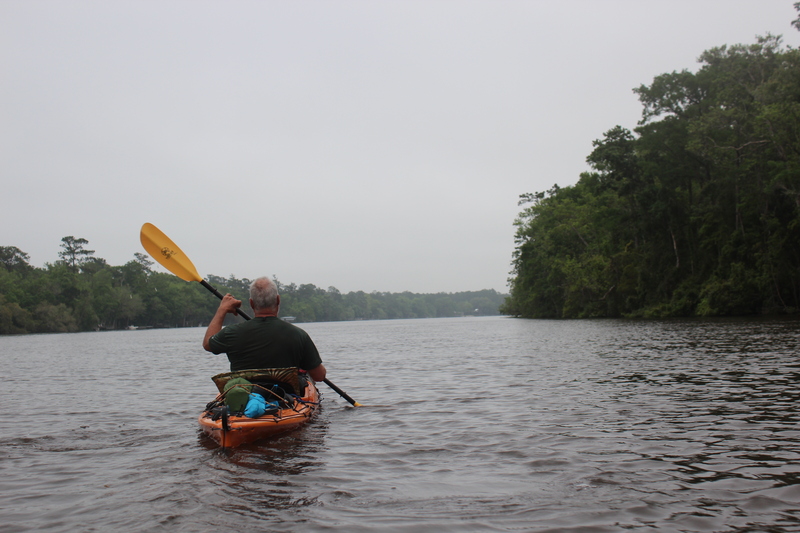 Contemplating any ‘paddle’ usually begins with ‘googling’ the river (an aerial perspective) and figuring out shuttle logistics; for paddling the 72 miles of lower Ochlockonee in the Florida ‘panhandle,’ the research was no different. 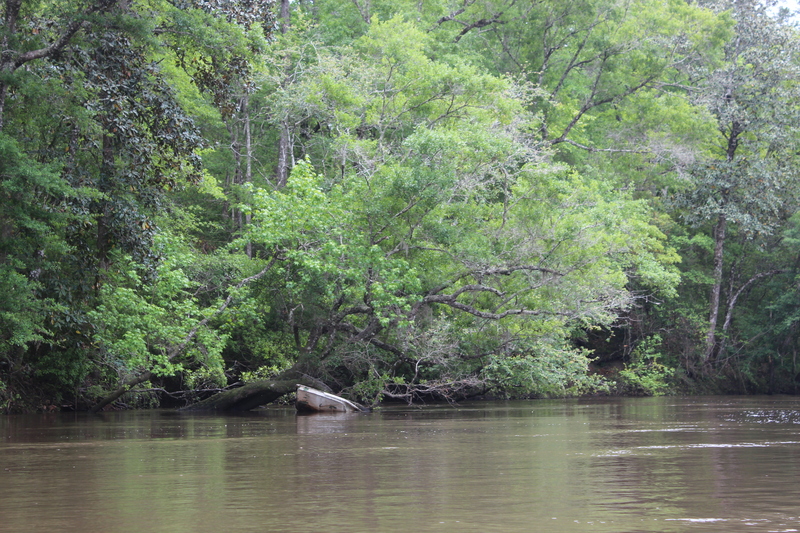 Visually the river ‘meanders’ back and forth; draining through the knotted terrain of the Apalachicola National Forest. 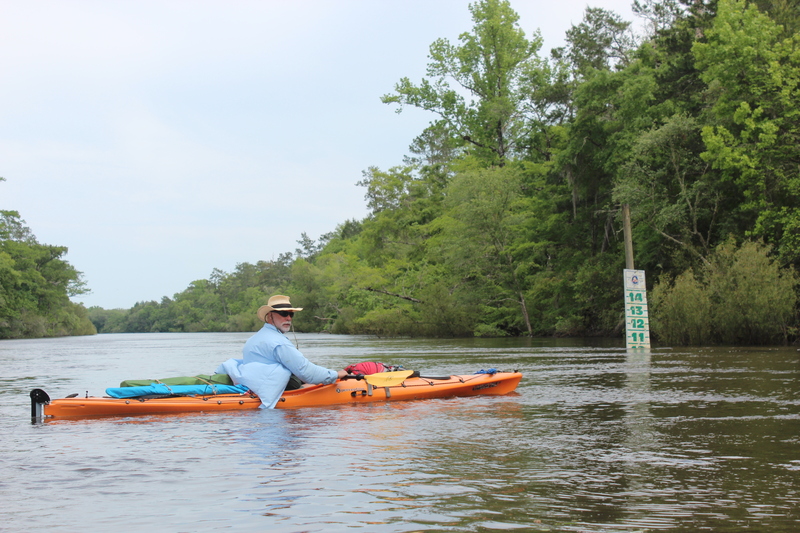 This ‘lower’ section of the Ochlockonee zig-zags from Lake Talquin (near Tallahassee, Fl) for about 72 miles through Ochlockonee Bay and into the Gulf of Mexico. Within research of the Ochlokonee, I was intrigued by it’s distance, current, and the terrain. 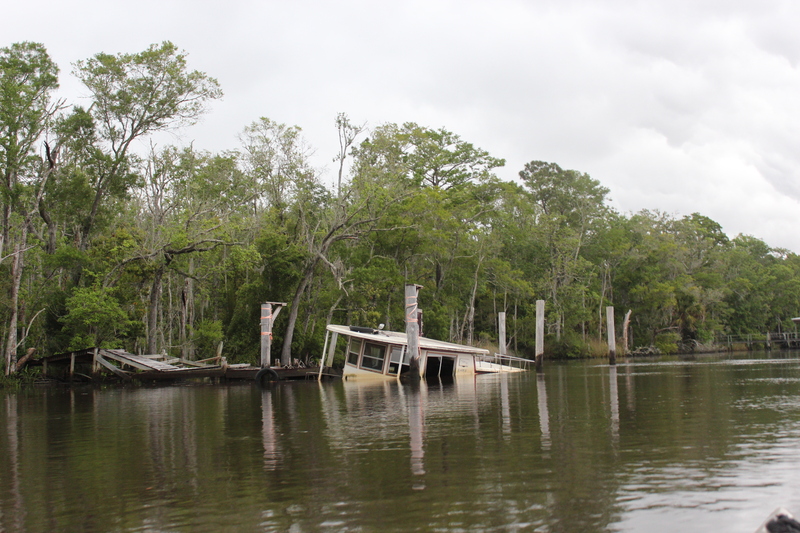 As for the logistic’s of parking at each end, we contacted Ed and Bernices Fish Camp near the dam (VGPS -15380 County C-120, Hosford, FL) , this is where we left our shuttle vehicle for three days – covered with a launch fee of 5 bucks each (Jean will fix you up). 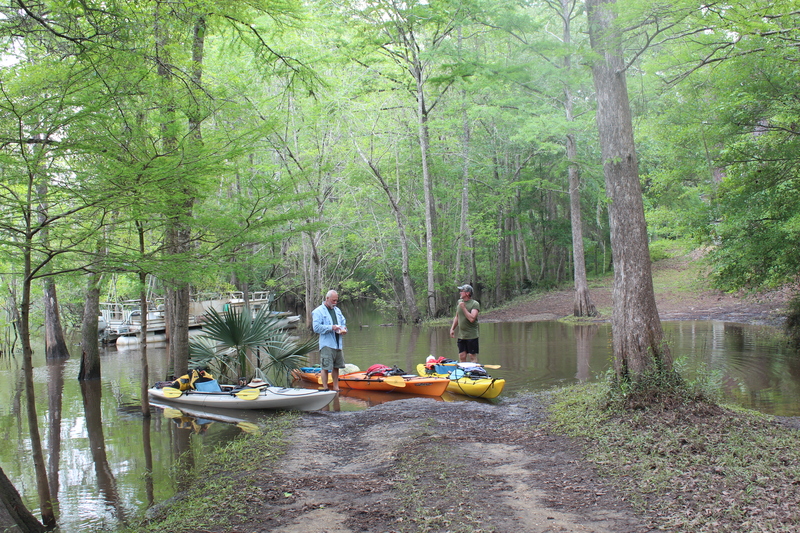 Initial thoughts were to stay at that campground before depart but with the recent flooding in the area – the grounds were left soggy (and no hookups). 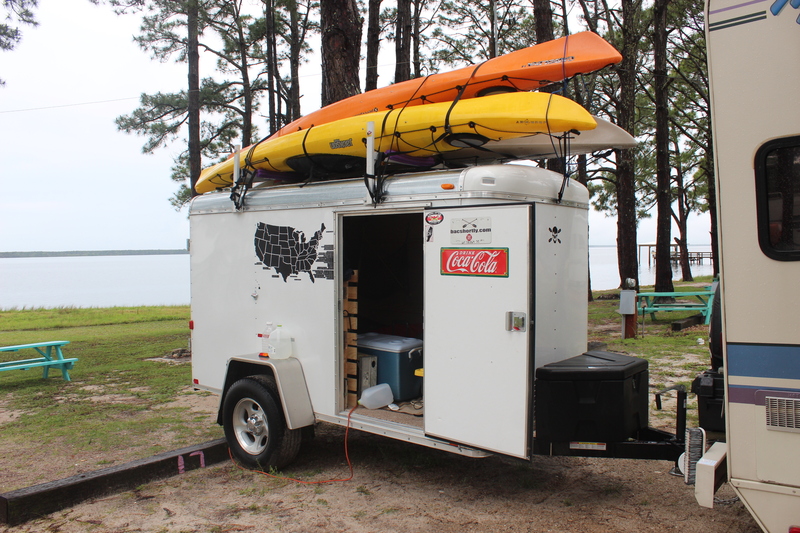 As for the lower-end there are at least two choices, Ochlockonee State Park or the Holiday Campground at Hwy 98 on the bay – wanting to include the bay we used the campground. 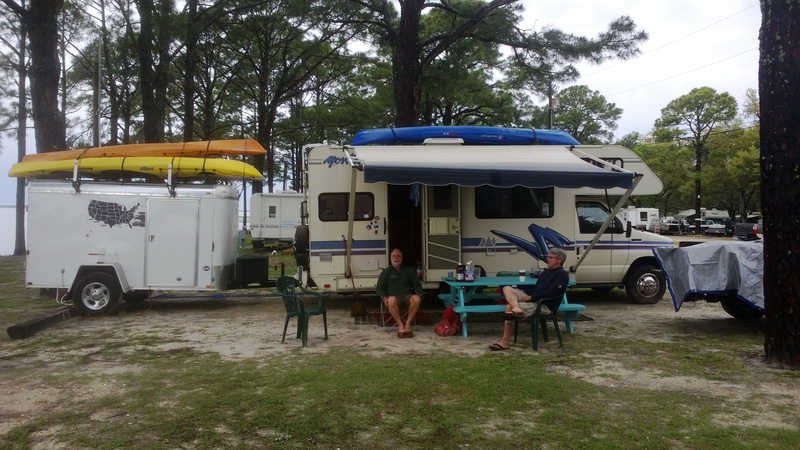 While hoping for good sleep prior to our Sunday start on the river, Saturday night campground (‘trailer-park’) neighbors brought the saying; – “you’re happiness is beginning to piss me off!” to lite – all in fun, and clearly – just a part of it. – simpler things like the ‘natural quality’ surrounding us. Just down from Ed and Bernices we passed one of the few homes along the river – there’s not many. 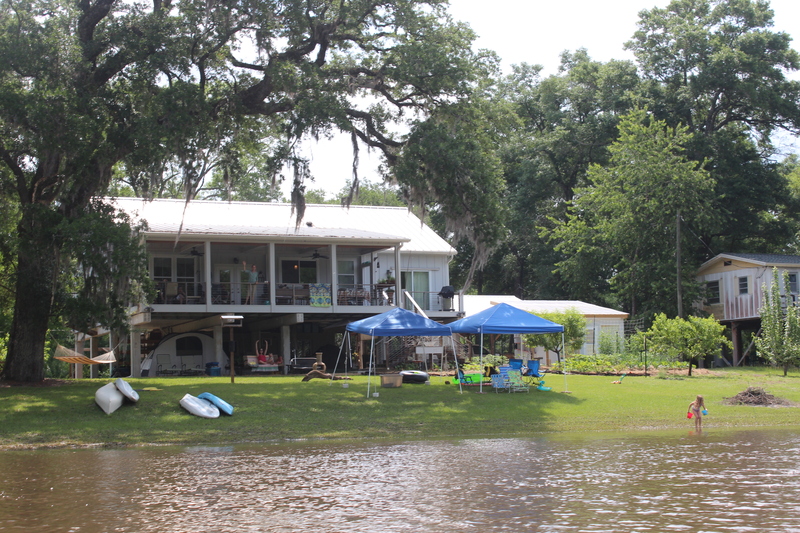 This home had children playing while parents watched – made us think about the alligators – not that alligators were a real concern to us, but maybe the children playing at water’s edge. 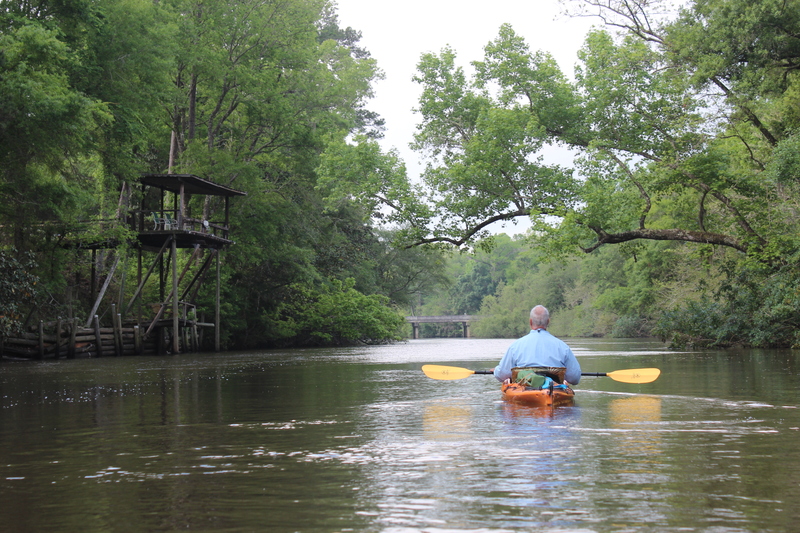 And it never hurts to find an official river water-gauge to ‘orient’ your paddle experience with – it won’t alter a set vacation but maybe lead to a ‘plan-B’ is necessary. Change happens more with low water readings. 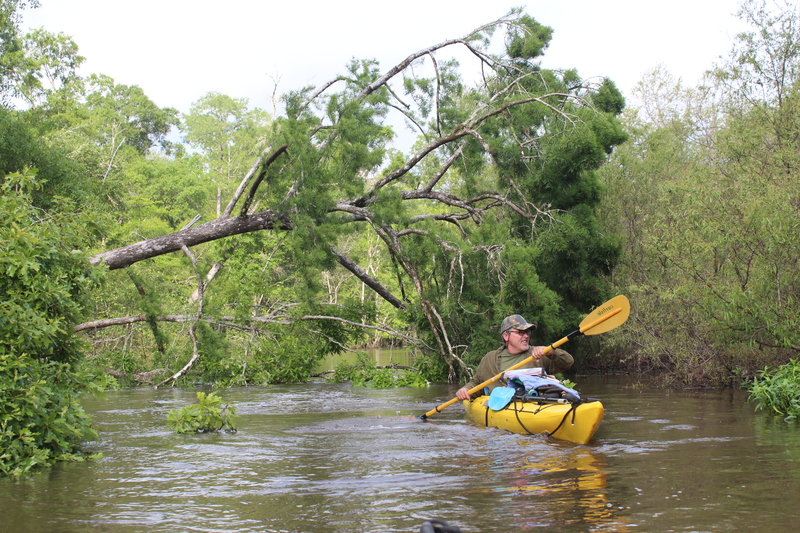 Our paddle-guage for the Ochlockonee was the Smith Creek reading – just above 13′ (and dropping from 16) – for this paddle, it was high water. 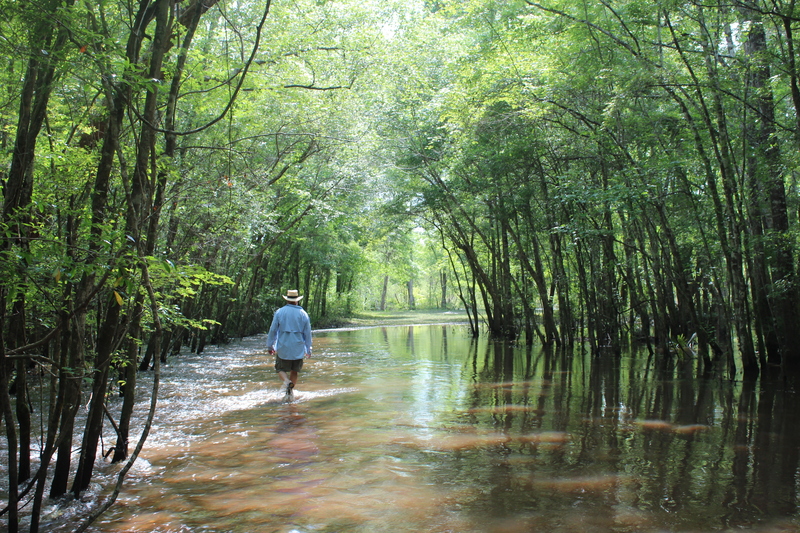 I have learned that high-water is not always a bad thing. In the first few hours we did pass a couple fishermen, but beyond that there were few landmarks leading me to think ‘unremarkable,’ this would change. 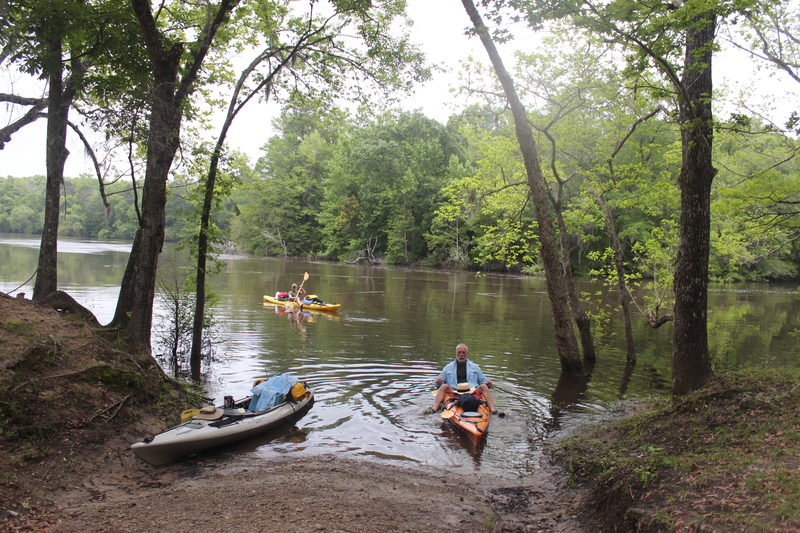 But being a paddle trail more ‘marks’ seem appropriate, not that markers really matter – but with a mundane shoreline ‘benchmarks’ are helpful in passing time – I have found this true along the Mississippi, and along the Current river. There was little to no cell phone reception available. Also present in the first few miles was an eagle, this birds seem to be more and more abundant along our river-ways – certainly not out of the ordinary to spot one anymore. Eagles are a good sign of recovery. 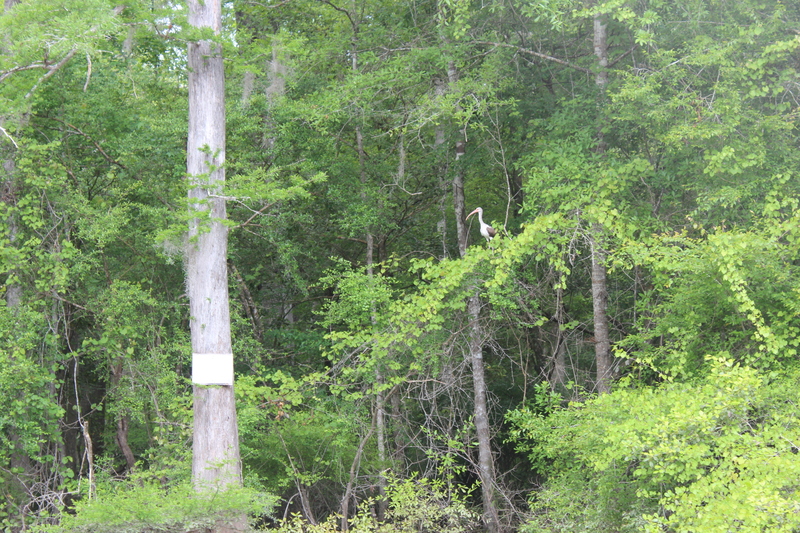 The ‘natural quality’ along the Ochlockonee included the common kingfisher, egrets, herons, and Osprey sightings – plus my buddies the owls. 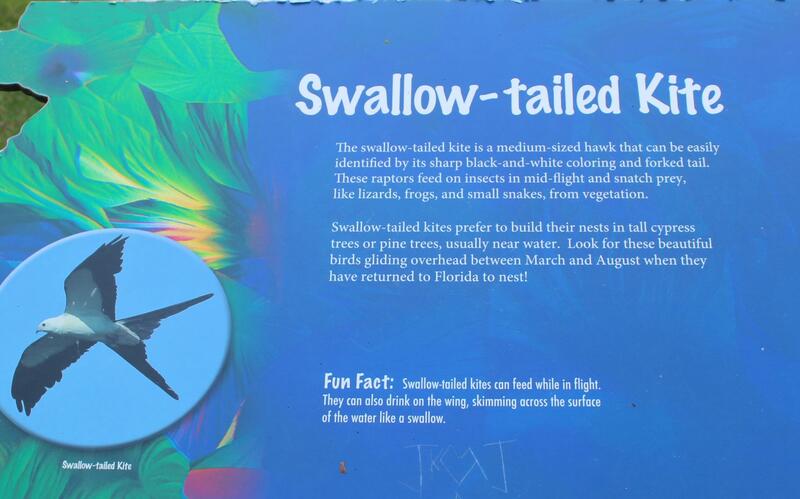 Leaning to different and interesting were the sandpiper’s and an ever present Swallow-Tailed Kite along the miles. 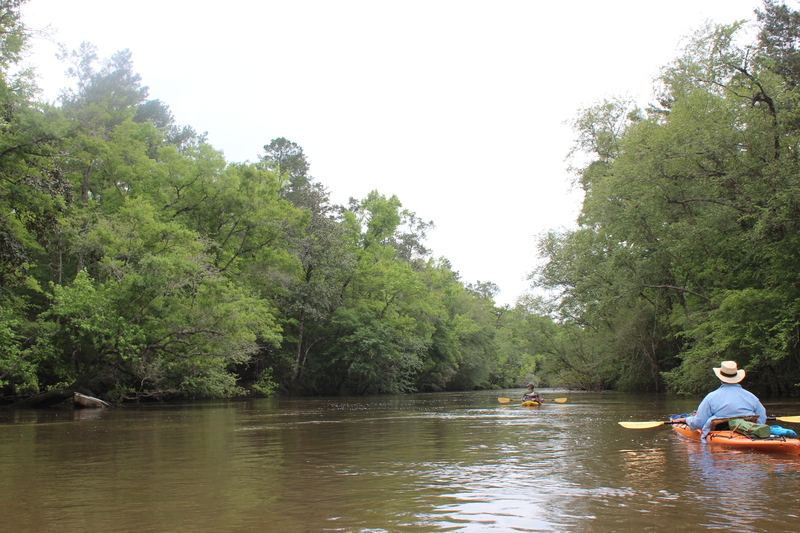 The ‘high-water’ was nice in that it allowed more room for error, and left room for an occasional ‘short-cut.’ Along the way there were numerous occasions to slip through the trees and catch the meandering channel of the river beyond the switchback ahead. At the old Langston Ferry crossing (1876) there is a small memorial porch to S.I. Sam Stoutamire (it was his property). 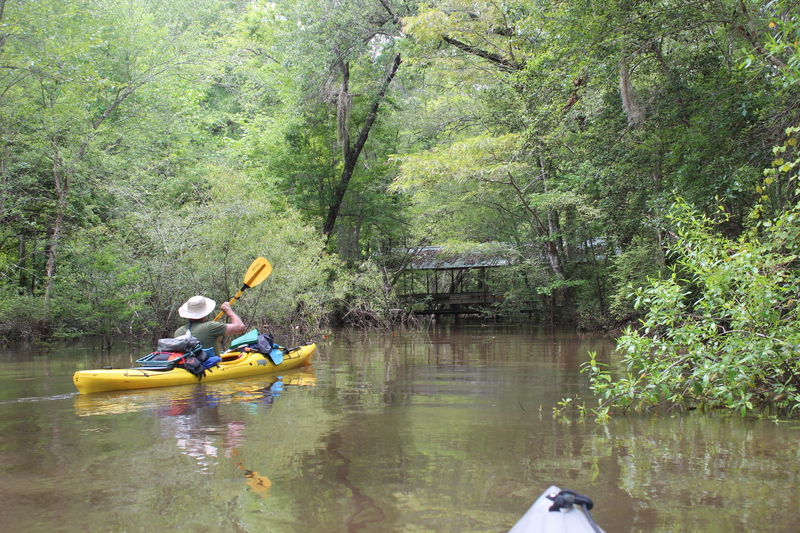 The water allowed us to paddle right up to the structure – interesting because of the church pews present. 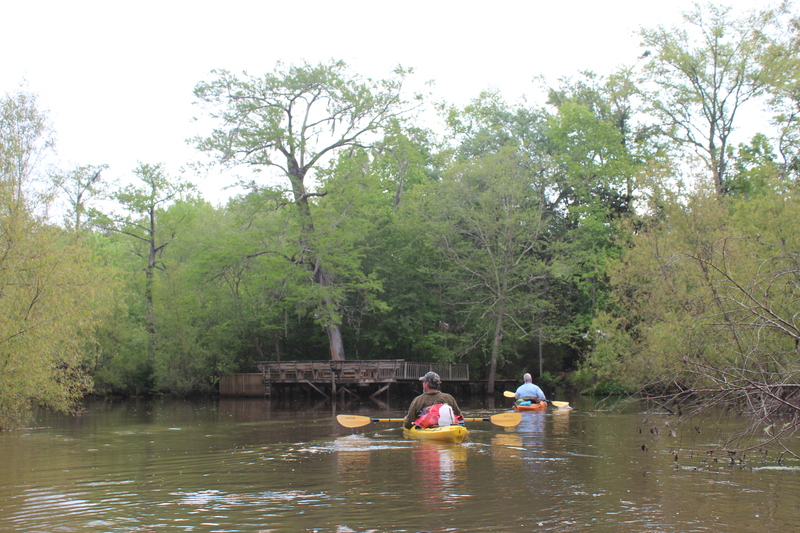 At 15 miles; The Huey P Arnold park boat ramp (note water level) was marked private; there were fire-rings, porta-johns and a dumpster – other than that the place didn’t look especially inviting. 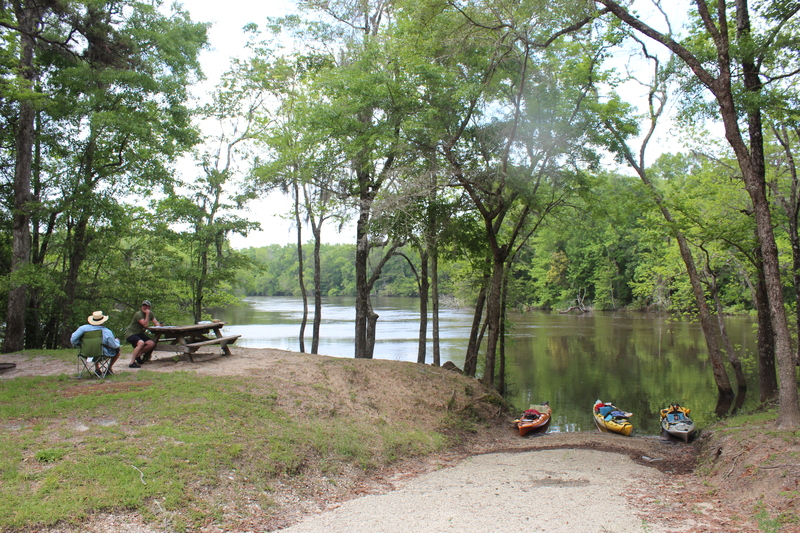 It was true that we hadn’t seen the rest of the river yet, in hindsite – the grounds were not affected by the high water and the place could have been a fine place to camp. The truth is that only 15 miles from the dam, we we’rnt ready to ‘drop anchor’ just yet. 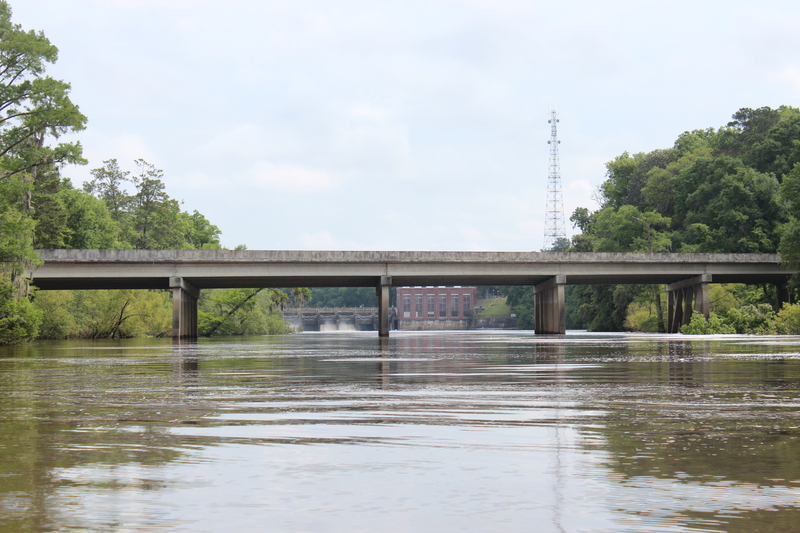 The river was moving along pretty well, my guess was 3.5 mph (as compared to the Suwannee’s 2.5). As usual there were the occasional strainer; but no apparent obstacles to speak of – Could it be the water level? I remembered the blogs where folks had turned over, and couldn’t help but once again think that group’ paddlin contributes to this. The congestion of folks (at different skill levels) creates conditions ripe for someone getting wet. Its all within ‘Why?’ a person paddles. 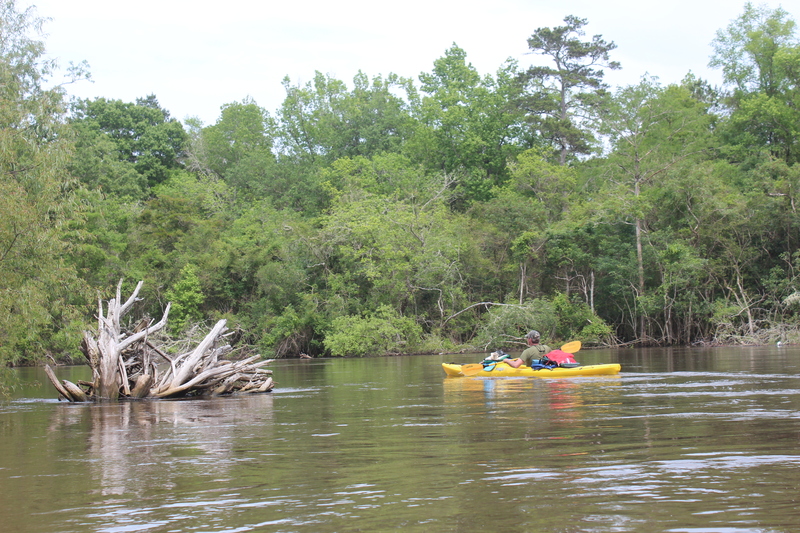 During the day there was plenty of time to ponder traveling this river at a lower water level, I wondered whether a more distinct channel was worth the obstruction challenges that could be present then. 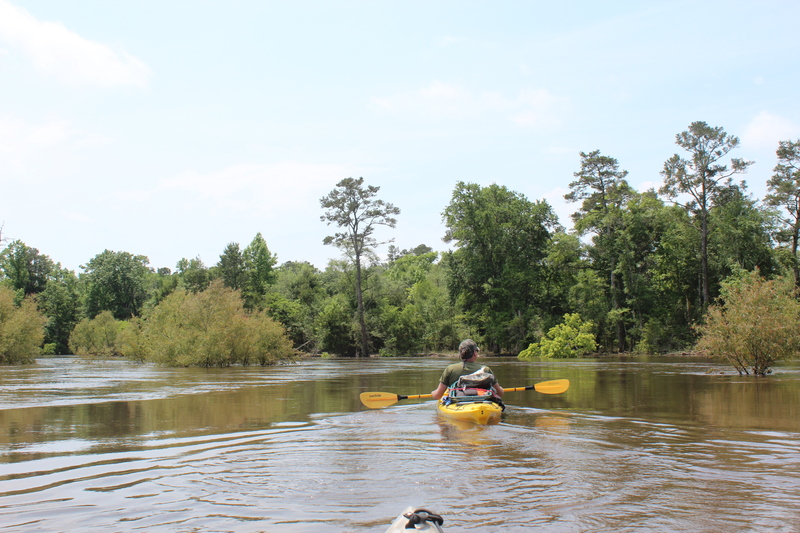 At 18 miles and in the late afternoon, we found more flooded conditions at Pine Creek landing. We had put-in at the dam near noon and five hours later it was time to seek a camp-site. 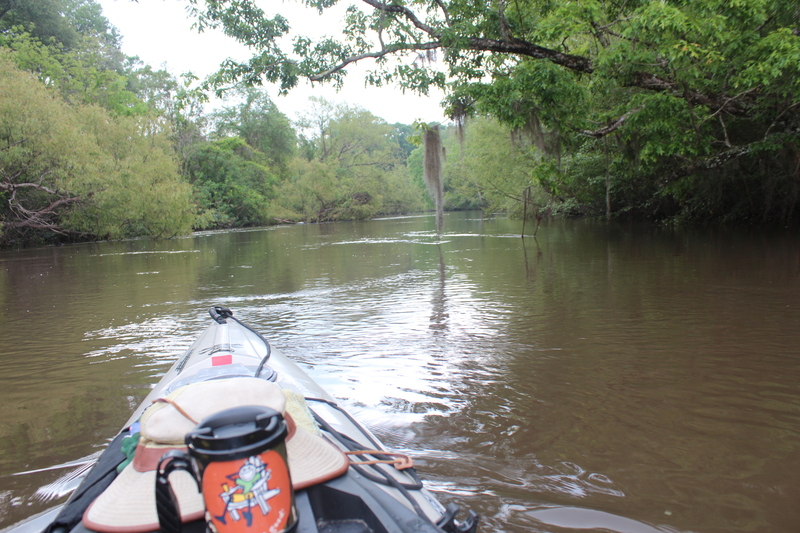 Pine Creek was muddy with a gator and once again could have worked, but we decided to move on a little further to seek the next best spot – always a gamble. 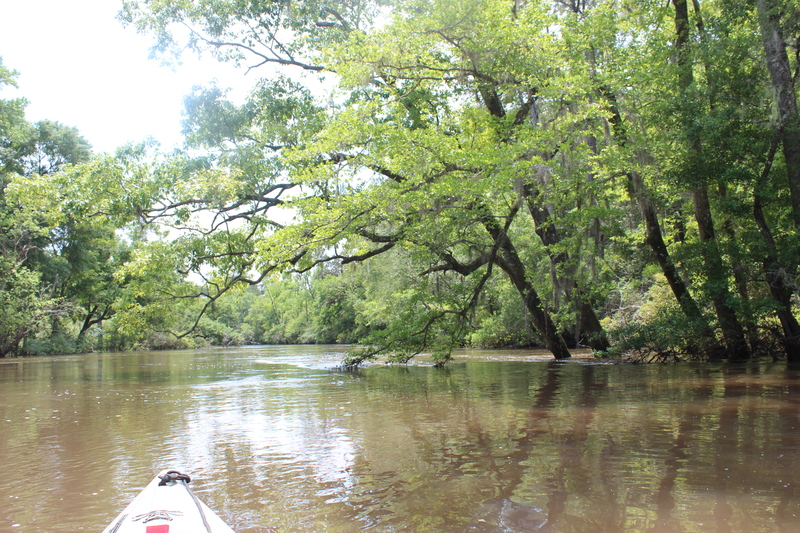 There was a nice flow to the water and the course was easy to follow – after Pine creek there were no places or shore to camp (kinda like the mouth of the Suwannee) and it was getting late. 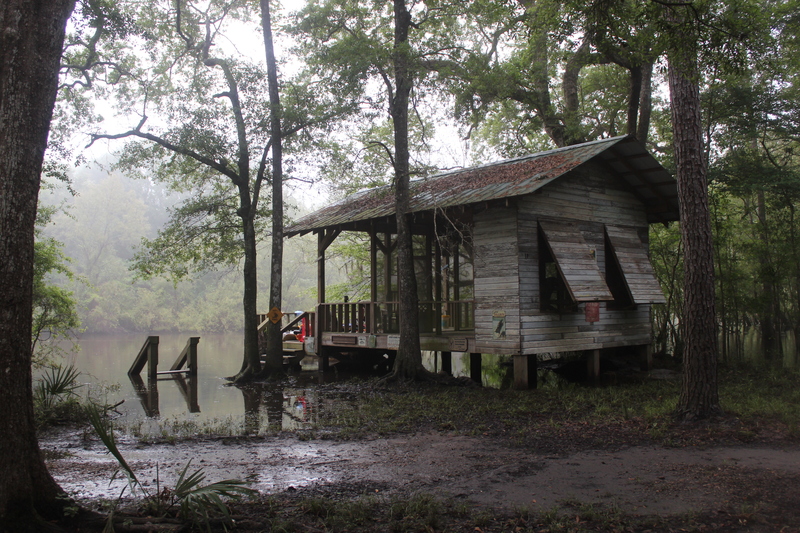 From out of nowhere this cabin appeared out of the dusk – we paddled right up to it. 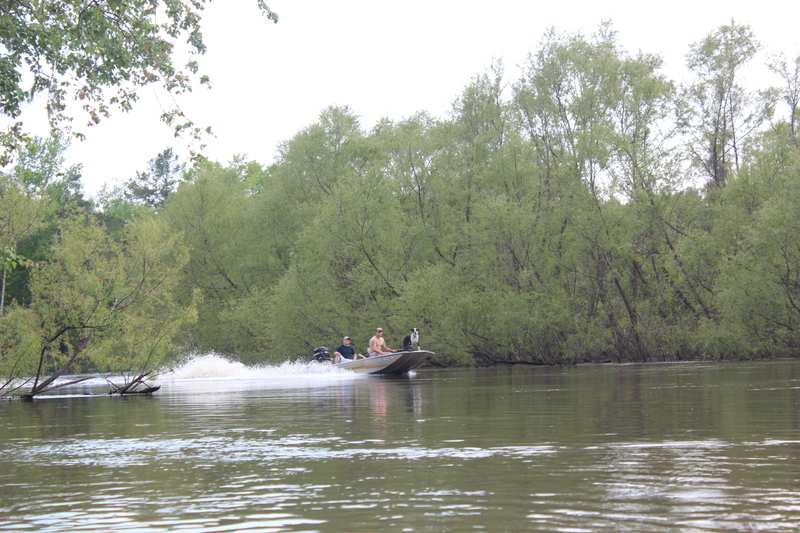 Now its not a usual practice to stop at someones cabin, but out of necessity and circumstance – we checked it out. The place couldn’t have been more perfect, and came at the right time. The deck would work just fine. So with a lot of respect and a little house keeping (had not been used in a while) we washed the heavy pollen from the floor and settled in for the evening, nice. We treated your place with respect and left nothing but footprints. Never seems to fail, a serious paddler goes down with the sun and is up with the morning light. 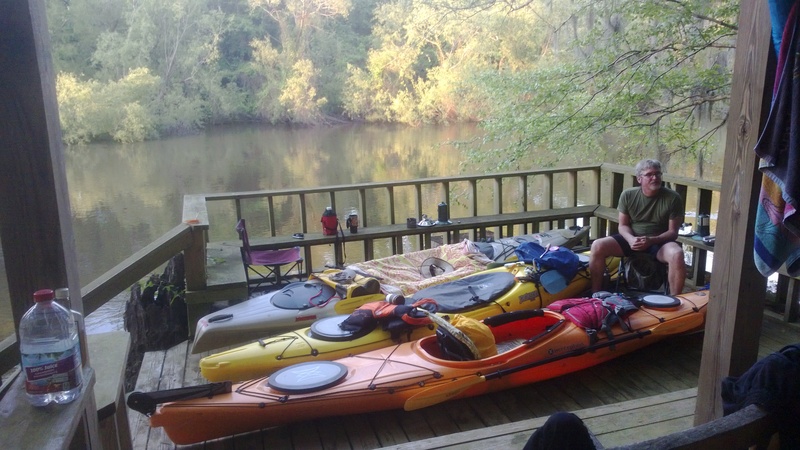 First thing, we had breakfast and river-jolt (coffee) in the most comfortable of settings, by 8am we were sitting ‘bac on the river. Mornings are absolutely the best time to be easing down the water. 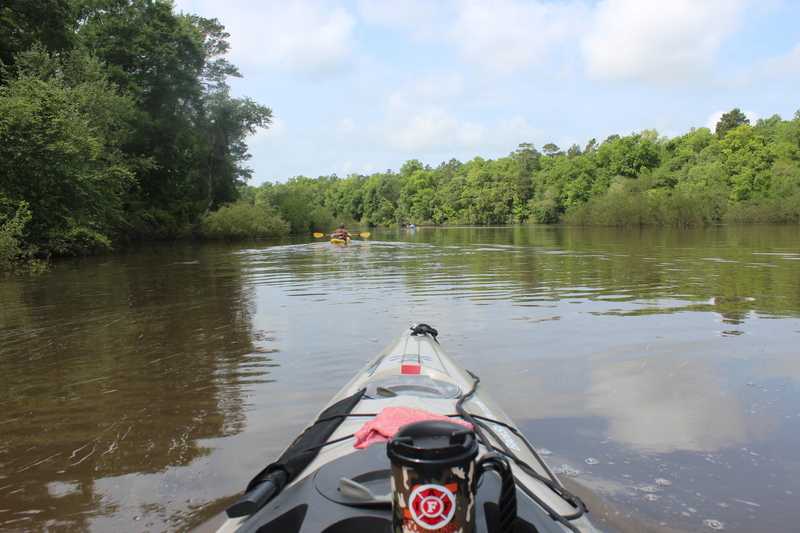 Nice to get back to that ‘lawn-chair’ feeling in the kayak, on the water. The channel of flowing water took us through some light brush – all easy obstacles, easy ‘lines’ (once upon them) to pick. 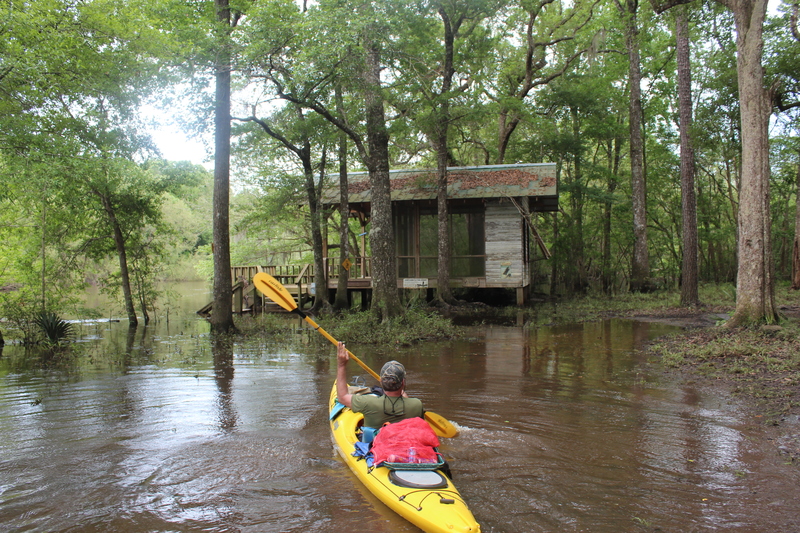 We eased passed Jack Langston’s Fish Camp a few miles downriver at 22 miles – would have been forced to camp here if ‘heaven’ wouldn’t have happened the night before. 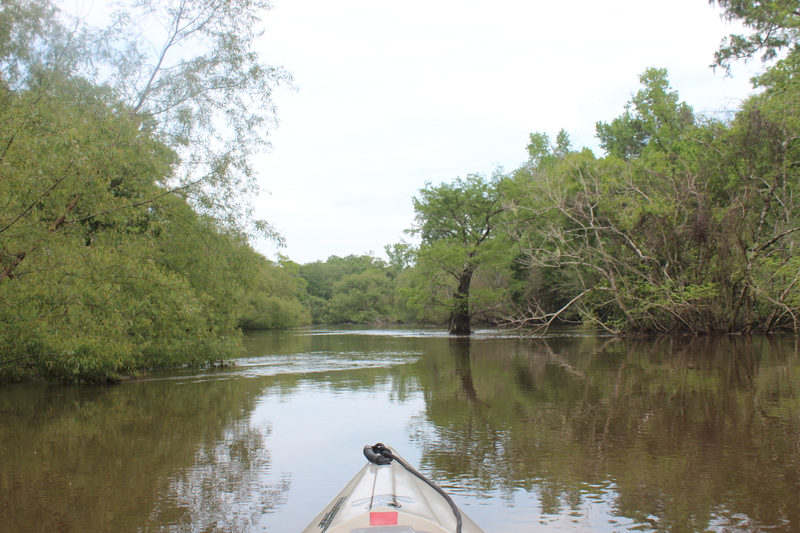 The Ochlockonee is not a straight paddle – your mind stays busy with the zig-zagging, brush, along with – the peace. 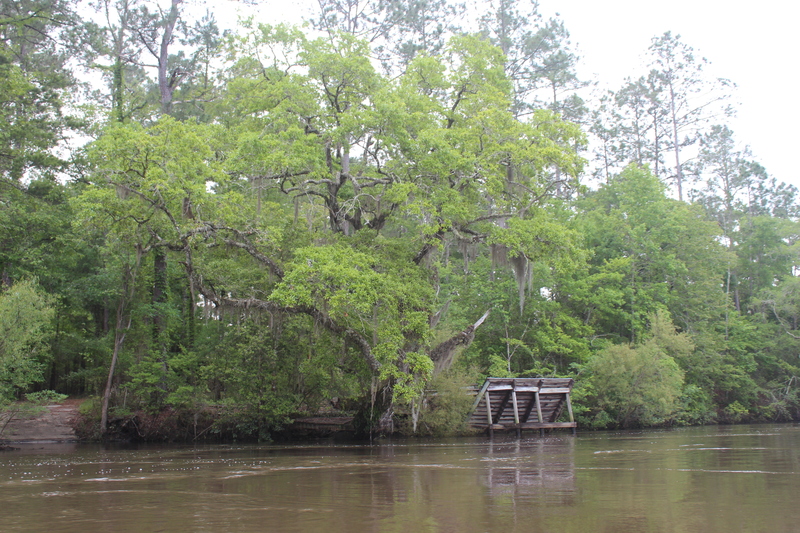 The interesting thing about the Ochlockonee was the changes – it changed from an unremarkable flow at the dam, to an interesting river. 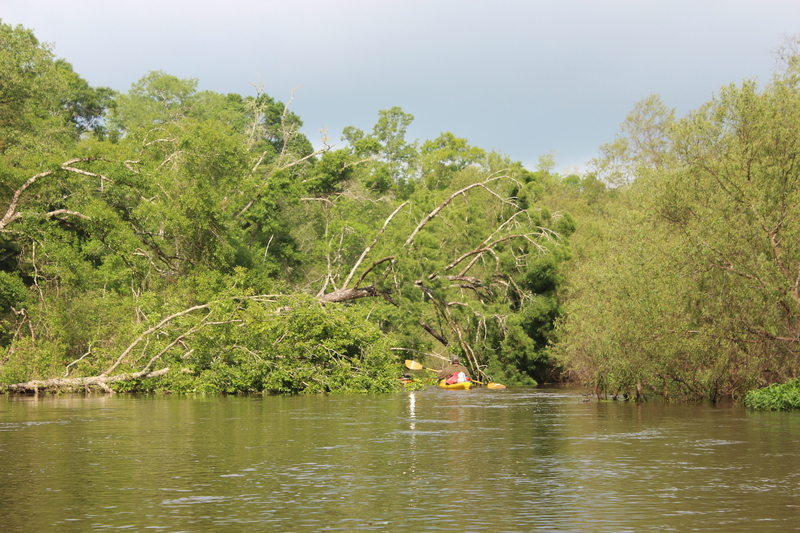 There are pools where the water sits before moving through small playful sections and curves – before channeling through a natural corridor into the Gulf. Somewhere about the 40 mile mark the unmarked Roberts landing came into view – just above Hitchcock lake, there were few places to stretch along this section so Roberts landing was good for a break – tap water available. After a full day of paddling with few landmarks or inviting stops – Tate’s Hell Campground came into view, 48 mm, once again – at the right time. The nights lightning-bug show was the most phenomenal that I have seen, and the owl’s entertained. The rest was well deserved after a long thirty-mile day on the river. . 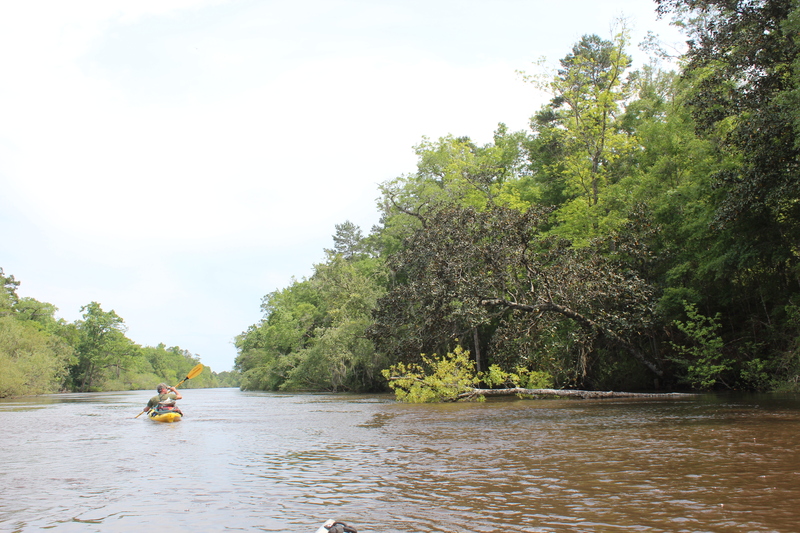 There is a ‘shortcut’ near Woods Lake entrance, we did see it (water flow) but being unsure stayed with the main channel. 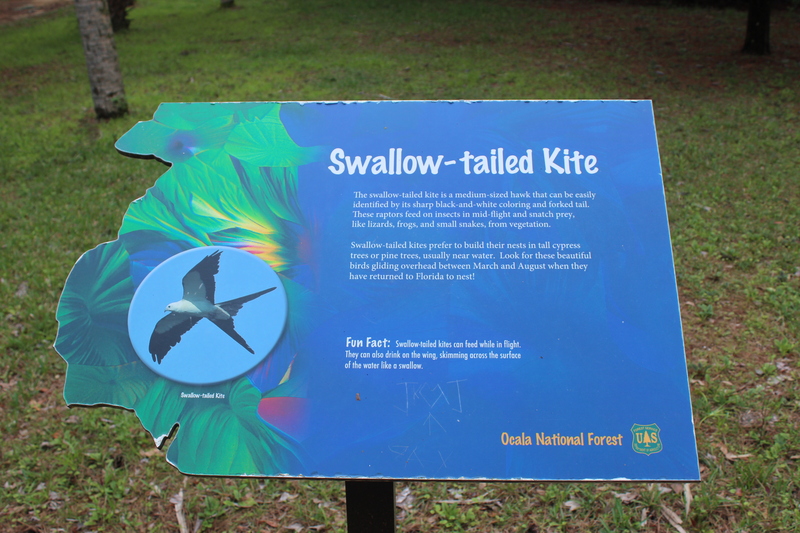 Along the distance we did notice ‘surveyor’s’ ribbon placed which could indicate a paddle trail – we saw ribbon that also marked fishing lines. 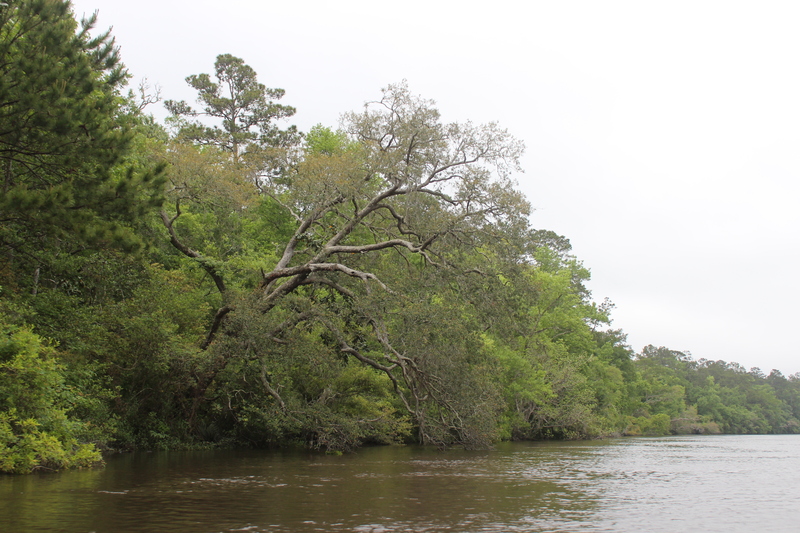 The river widened and began to have the heavy coastal feel to it. 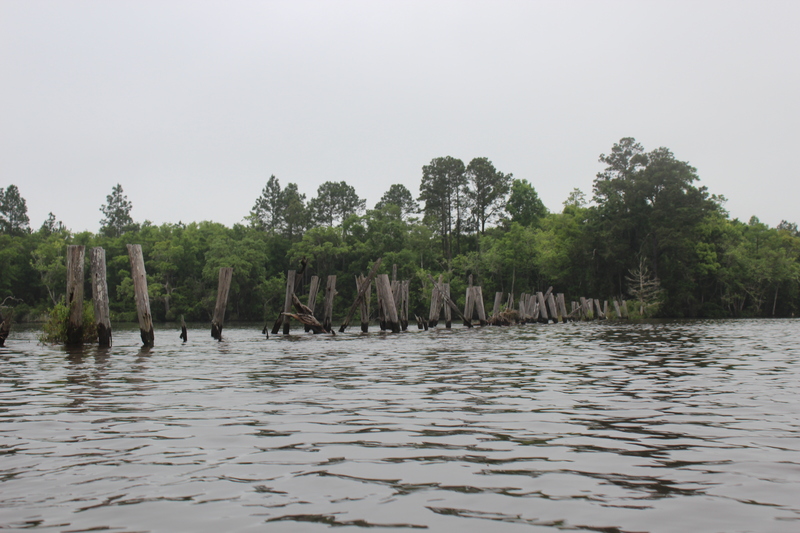 Here just below Sopchoppy and before hwy 377 (@57 mm), the Georgia Florida and Alabama RR trestle pilings still stand from the 20’s. 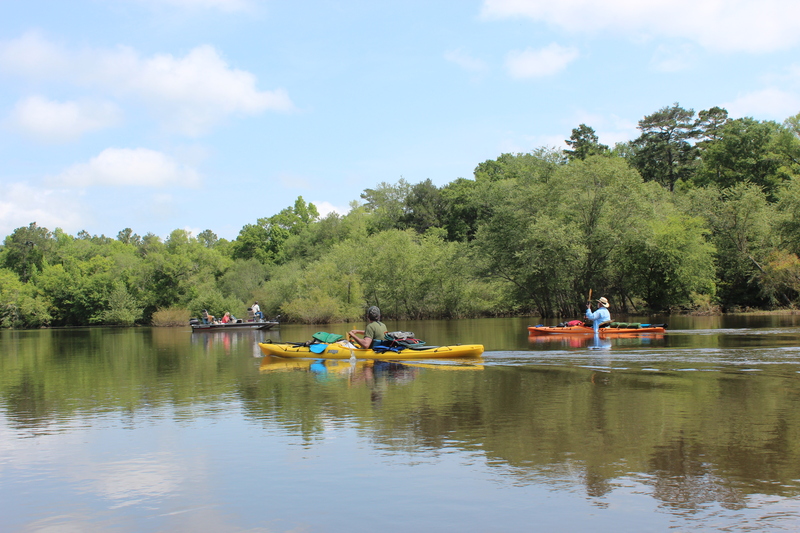 Sawgrass – the coast is not far off, I’m sure that the tide has some influence on this area but on this date and paddle the predominant thought was becoming more about – the weather! ‘chicken-little,’ and the sky began to fall! 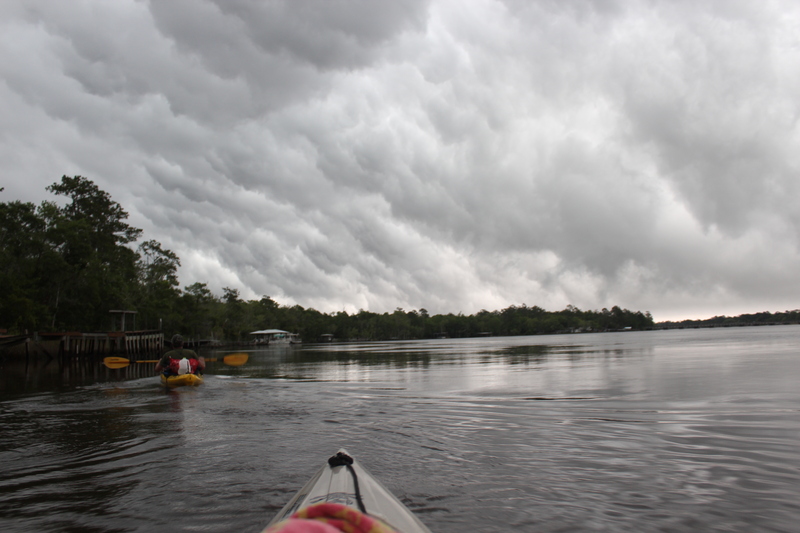 Now I don’t mind paddling in the rain – but this was a very active weather front bearing down on us. 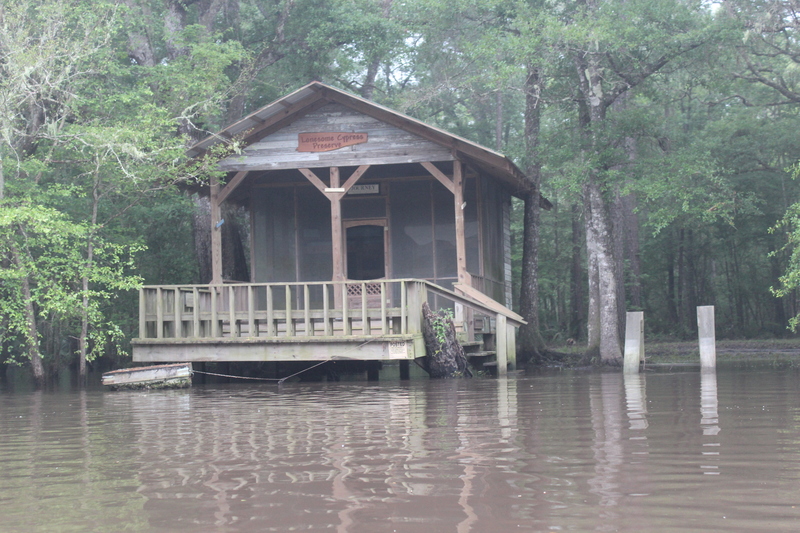 As the first rains came about 11 am we found an empty boathouse, got under the roof and relaxed – it was a good time to review our options. 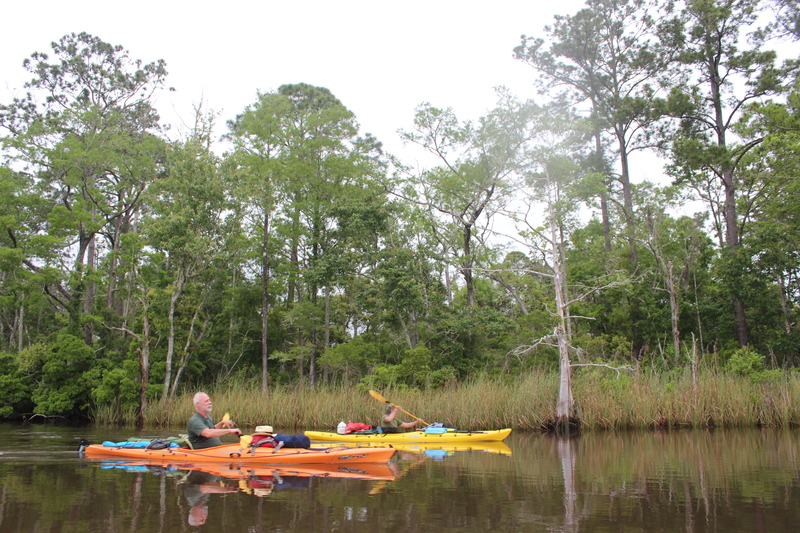 From our point it was a 4-hour paddle to the campground; the state park was the only thing between us and the bay (besides the boathouse we were in). We put our feet up, ate, drank, and contemplated – we would have to decide by one pm if we wanted to commit. After two hours and a little let-up in the rain we gave it a go – once in the open, the weather enveloped us. 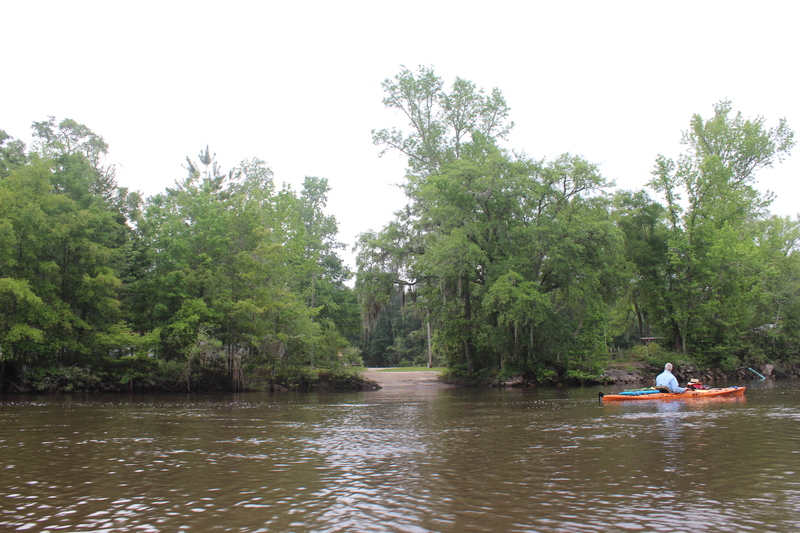 It’s not the kind of situation paddlers like to be in; out in open sawgrass without options. 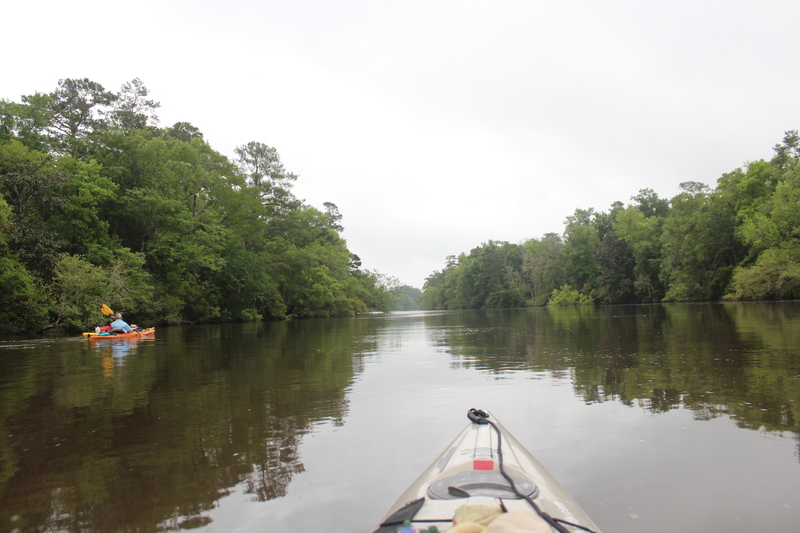 It was a solid paddlin situation – it counters enjoyment and my reasons for being there. 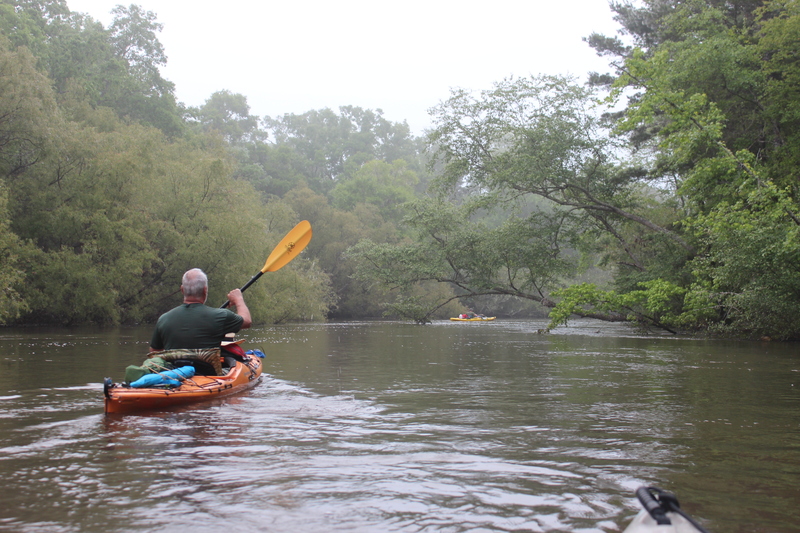 The paddle action was a constant ‘dig’ along with frequent lightning-bolts, which sure invigorate the effort. 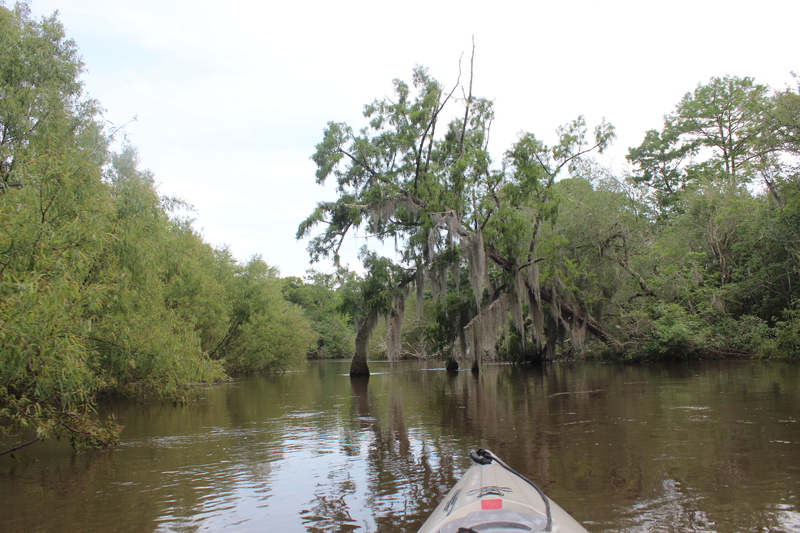 While working the wind and river near the saw-grass I jabbed an unsuspecting 10+’ gator with a stroke – I say that because I had the best view of him as he suddenly rolled under my paddle in the shallow water before lurching under the nose of my kayak towards open water. 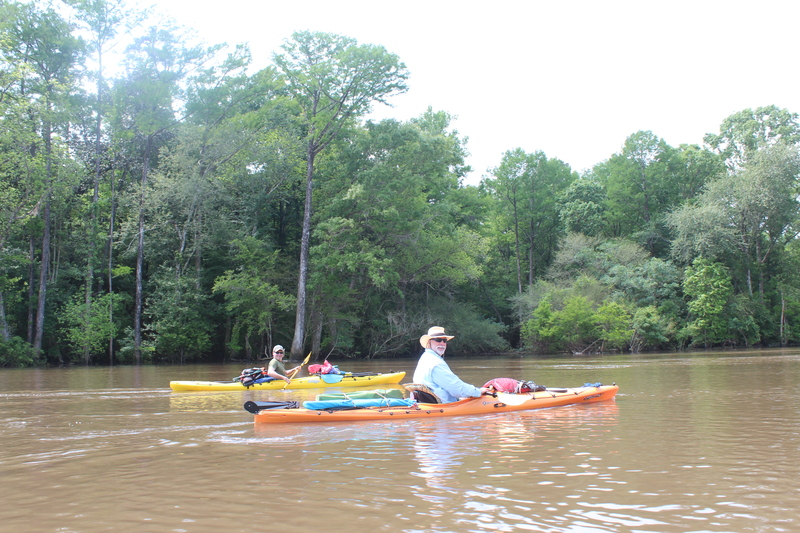 The action was fast and intense – and lifted my kayak into the air; ending with a large splash. Way too quick to be a oh-crap moment. The ending was good and under the circumstances – I never missed a stroke. 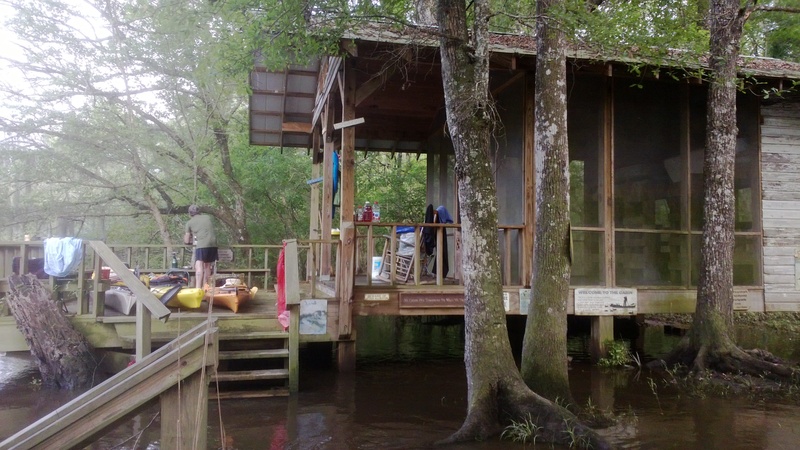 Almost 6 years ago my boyfriend (now husband) sold me on the idea of a relaxing canoe trip down the Ochlockonee, where we’d camp under the stars on a white sandy beach. We way underestimated the distance, and the white sandy beaches gave way to nothing but dense brush to the water’s edge and an occasional house. We were desperate; I was scared. 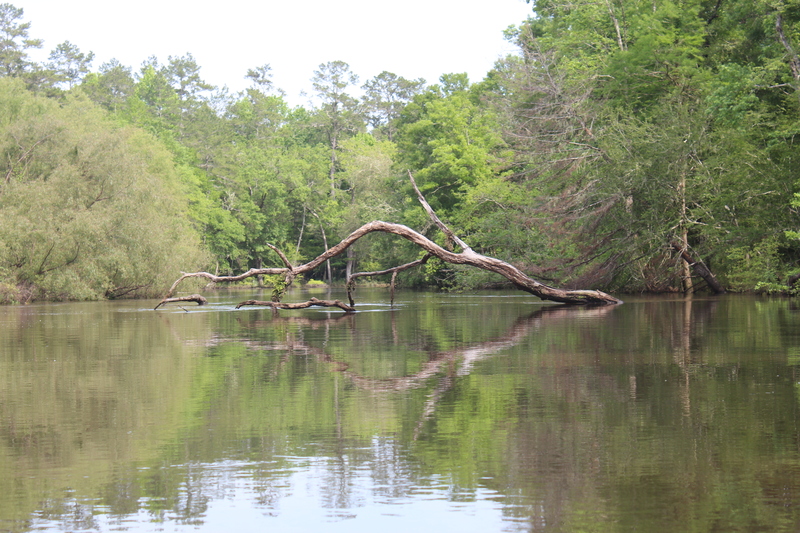 I was ready to ask a homeowner if we could pitch a tent on their lawn when we saw the Lonesome Cypress. It was starting to get dark and nobody was there – we figured if some fishing buddies were planning to make use of it they would have gotten there before dark. And all the wood cut outs with clever sayings (I love Mark Twain) that told me it probably wasn’t owned by a serial killer was a bonus. So just like you, we had a place to stay. Good thing, too, because my boyfriend happened to have a ring in his pocket, and he says if we hadn’t found that place, he wouldn’t have pulled it out that night. I’ve googled it a couple of times and it’s always been a mystery. I guess it still is, but at least someone else has experienced it like we had!